Cisco 2960S series, Cisco 3560X and 3750X switches are so popular and commonly used by Branch, Business and Campus. If an organization decides to set up a better and more secure network, there are some key elements considered such as Power Consumption, Product Performance, efficiency, business Processes and so on. Miercom tested Cisco’s three catalyst switches-Catalyst C2960S-48TS-L, C3560X-48T-S and C3750X-48T-S. What are the main findings and conclusions? Let’s share the main points that Miercom reported. The Catalyst switches proved to be energy efficient, environmentally friendly and easily manageable Layer 2 and Layer 3 switching solutions. The three Cisco Catalyst switches are operational out-of-the-box using default settings. Additional configuration is provided through CLI and Web browser GUI. The switches are compatible with Cisco’s EnergyWise software that manages power usage for optimum cost savings. With EnergyWise, devices can be placed into sleep mode when they are not needed so that power consumption is reduced. Power measurements were taken of the Cisco C2960S-48TS-L, C3560X-48T-S and C3750X-48T-S switches with different Layer 2 and Layer 3 frame sizes and traffic loads. The effect of the various frame sizes on the power consumption was measured. 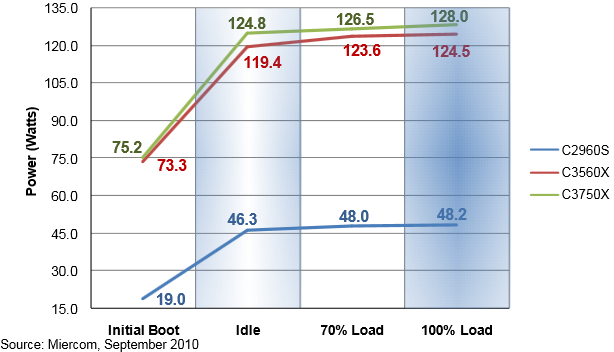 Power consumption of the products was measured while they were at idle and with 70% and 100% traffic load. Cisco Catalyst Switches Power Consumption Relative to Load. All ports loaded, 1518-Byte Frames, Specified Load. Comparison of power consumption for both Layer 2 and Layer 3 traffic with 1518-byte frames and at 70% and 100% link utilization. There was a minimal increase in watts consumed when comparing Layer 2 and Layer 3 traffic. *The C2960S-48TS-L supports Layer 2 only. Power profile showing the power consumption in various modes of operation from power up, idle and 70% and 100% link utilization at 1518-byte frames for the switches under test. C2960S-48TS-L: This switch has 48 10/100/1000 Base-T ports and four 1 GbE SFP ports. Power consumption for this switch was recorded using 1518-byte frames. The C2960S-48TS-L consumed 46.3 watts at idle with link, 48 watts at 70% traffic load and 48.2 watts at 100% load. C3560X-48T-S : The Cisco Catalyst C3560X-48T-S switch has 48 10/100/1000 Base-T ports and four 1GE SFP+uplink ports, two upgradeable fans and power supplies. We measured power consumption of the switch using 1518-byte frame sizes while the switch was at idle, 70% load and 100% load. For Layer 2 traffic, results showed the switch consumed 119.4 watts at idle, 123.6 watts at 70% traffic load, and 124.5 watts at 100% load. Layer 3 traffic at idle registered 119.4 watts, 123.6 watts at 70% traffic load, and124.4 watts at 100% load. Layer 3 traffic at idle registered 119.4 watts, 123.6 watts at 70% traffic load, and124.4 watts at 100% load. 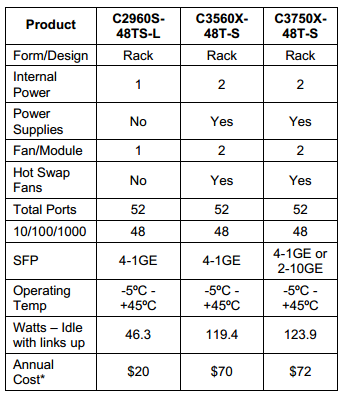 C3750X-48T-S : This switch has 48 10/100/1000 Base-T ports, four 1GE SFP+ and two 10GE SFP+ uplink ports, two upgradeable fans and power supplies. Power consumption was tested using a 1518-byte frame size while the switch was running at idle, 70% and 100%. Tests run at Layer 2 on the C3750X-48T-S consumed 124.8 watts while at idle, 126.5 watts at 70% and 128 watts while at 100% load. At Layer 3, the switch consumed 124.8 watts at idle, 127.1 watts at 70% and 128.1 watts at 100% traffic load. When examining energy consumption based on a function of throughput, all the switches under test outperformed the industry average based on Watts per Gigabit. Throughput performance of the C3560X and C3750X performed better than the Industry Average when focusing on watts used per port. Watts per Gigabit was measured at 100% load using a 1518-byte frame size at Layer 2 and Layer 3. At Layer 2 and Layer 3 the C3560X consumed 2.42 Watts per Gigabit. 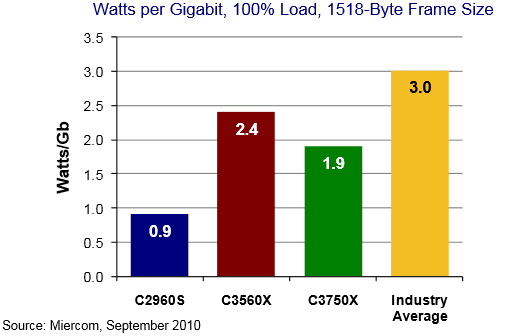 At Layer 2 and Layer 3 the C3750X consumed 1.90 Watts per Gigabit. The Industry Average for Layer 2 traffic at 100% using a 1518-byte frame size is 3.00 Watts per Gigabit. The Cisco Catalyst C2960S has 48 10/100/1000 Mbps auto-sensing ports and four 1G SFP uplinks. The C3560X and C3750X both have 48 10/100/1000 Mbps auto-sensing ports and four 1GE and 2 10GE SFP+ hot swappable uplink network modules. The C3560X and C3750X have two upgradeable power supplies each. The switches also have two upgradeable dual-speed cooling fans. These are essential features that all switches should possess. As technology advances in power efficiency and cooling, these switches can be upgraded rather than replaced. The C3560X and C3750X can be configured to use the StackPower feature that requires between two and nine physical switches to enable power sharing efficiency. StackPower technology reduces the number of power supplies needed per switch, and allows the switches to perform at optimum efficiency. The three Catalyst switches can be easily managed via a secure Web browser interface with Cisco Network Assistant and CiscoWorks LAN Management System. The Cisco IOS CLI can be used for more thorough configurations via serial console, Telnet or SSH. Configuring interfaces, IP addresses, VLANs and many other features with the Cisco Web GUI makes it extremely easy to configure and takes very little time. The C3560X and C3750X series switches are capable of using the Cisco StackWise feature that enables multiple switches to act as one. The switches in the stack use special stack interconnect cables that create a continuous connection between the switches. Once the switches in the stack are configured properly, the stack can be managed with a single IP address. Switches can be added or removed to and from the StackWise implementation without affecting performance. The C2960S series switch has a similar feature called FlexStack. FlexStack also combines multiple switches to act as one to gain redundancy and high availability. Cisco reduces waste output by engineering products that use fewer materials to operate. Cisco products are capable of being upgraded, refurbished and recycled, instead of being disposed of which would increase landfill waste. Cisco aims to reduce both operational and environmental costs by offering new ways of communication and manageability. They believe that there is a need for working productively across distances without travel, to reduce emissions and keep the environment sustainable. Cisco has two green programs that they endorse: EnergyWise and SmartGrid. Cisco’s EnergyWise software controls power consumption of network devices to reduce overall cost and provide energy savings. Cisco’s SmartGrid is a combination of products, technologies, services, and ecology-minded partners that optimize communications and reduce the operational cost and intricacy of the energy grid. The Cisco Catalyst C2960S, C3560X and C3750X switches are able to run in higher temperature ranges so that fans run at lower speeds, lowering energy consumed by the fans. Cisco also has the ability for its switch power supplies to be put offline when they are not in use. Since 2008, Cisco has reduced the amount of paper, plastic and metal materials that ship with their products. They have replaced these materials with more environmentally friendly solutions, such as using 100% recyclable materials and removing nonessential materials like magnets, rubber feet and generic cables.